The stable had one winner from six starters during the second half of September with Trois Choix saluting on the last day of the month to claim a second successive win. Both of the seven-year-old mares win (from only three starts this season) have come over 1600m … one on a good 4 and one on a soft 7 … underlining her versatility in terms of the going. There was also a second placing for Willo Titto in that mix but, while they were important enough results in themselves in terms of ensuring the overall progress of the stable, the undoubted highlight of this period was Baccarat Baby’s attempt at Group 1 glory in the Flight Stakes at Randwick on September 27. That final result showed that Baccarat Baby finished in fifth place, just 0.80 lengths behind Oohood, but there was a heart-warming, three-part, back story to the race that did the stable proud. 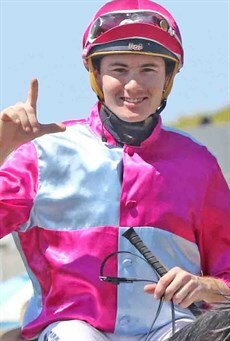 Part 1 was the loyalty the owners and the trainers showed to the rider Michael Hellyer. Part 2 was the race itself and the mighty effort Baccarat Baby put in against some of the best three-year-old fillies in the country (see race description below). Part 3 was the wonderful moment and sense of achievement it gave to Michael Hellyer in his first ride in a Group 1 challenge. Owners: Harris Family Racing, Mr M R A Irwin. Sept 29: Randwick – Group 1 Flight Stakes – 1600m. 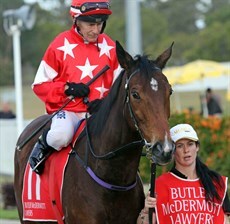 Sept 27: Doomben – Three-Year-Old Handicap – 1600m. Sept 30: Sunshine Coast – Open Handicap – 1600m. THE GROUP 1 FLIGHT STAKES – HOW THE RACE WAS RUN. There would be no messing around here. This was a race between quality three-year-old fillies which would test Baccarat Baby to the full on a number of levels. Baccarat Baby, who started at $41, was allowed to find her feet without being rushed and she settled towards the rear of the field in the early part, some seven lengths off the lead. At the 800m, halfway through the contest, the runs were already starting to come, most notably on the favourite Miss Fabulass who was chased up three wide into the leading line by Kerin McEvoy approaching the home turn. Michael Hellyer, riding in his first Group 1 race, remained unfazed by the forward movement around him and the quickening of the pace, being content to hug the rail saving ground, but locked away, so that Baccarat Baby straightened a little more than three lengths off the leaders. Baccarat Baby stuck to her task gamely, slowly winding up. She wasn’t helped by the fact that she had to switch around heels at the 150m mark, but she angled out with the minimum of fuss and was now in full stride. With 50m left to run Baccarat Baby was again running of room as the flying Oohood (14-1), Fiesta ($5.50), Nakeeta Jane ($14) and Miss Fabulass ($2.25) went to the line together as four horses strung right across the track. Just over a quarter-of-a-length separated these first four runners in the photo finish with Baccarat Baby, who had to ease in the final stages because of the congestion in front of her, finishing in fifth spot, just 0.80 lengths behind the winner. Trois Choix jumped so well it almost looked like a false start but, although this was only a three horse field, there was plenty of keenness early with First Stimulus and Bodega Negra both quickly going past the Vandyke trained runner with jockey Damian Browne quite content to take the trail. The three runners held their positions in a fairly tight knit group until the home turn where, after being allowed to relax so much early, Trois Choix had to be pushed along by Browne who persevered with that encouragement until Trois Choix got the message that the race was now well and truly on. Bodega Negra was the first to cry enough and, once Trios Choix lengthened into full stride, First Stimulus, in spite of receiving 5kg from Trois Choix, likewise proved to be no match for the $1.40 favourite leaving Trois Choix to win a touch more comfortably than the official 1.50 length margin suggest. This was Trois Choix’s eighth career win and her second in succession. Sept 19 – DIDN’T MENTION IT – Doomben – Fillies & Mares Class 3 – 1350m. Sept 21 – CHAMPAGNE DAISY – Ipswich – Maiden – 1100. Sept 28 - WILLO TITTO – Sunshine Coast – F&M Class 1 – 1400m. 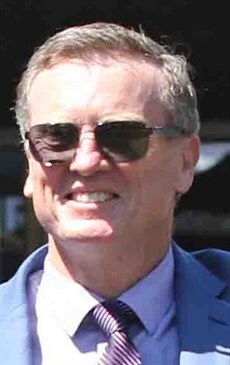 David Vandyke … he was thrilled with Baccarat Baby's Group 1 effort. Trois Choix (pictured at an earlier start) kept the stable scoreboard moving by landed a second successive win.